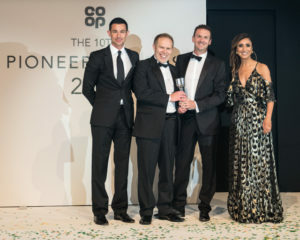 Leading food-to-go and fresh produce business Freshtime has been recognised for its extensive work in the community at the 10th annual Co-op Pioneer Awards. The Boston-based company was awarded Pioneer in the Community at the ceremony, which was held at Manchester Central Convention Complex on Thursday 14th September. 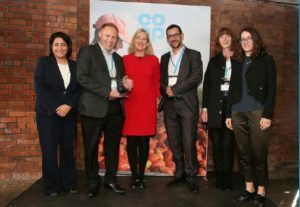 Over the last decade, the awards have become established as a key date in the industry’s event calendar and recognise the achievements of the Co-op’s partners and suppliers. Freshtime’s work in the community includes that of its charity, the Freshtime Futures Trust – launched in 2016 to help young people in Lincolnshire achieve their ambitions. The company also works closely with schools in Boston and has been running the Freshtime Fun Club since 2014, during which time a dedicated team has delivered interactive and educational sessions to over 2,000 pupils. Together with Boston Borough Council, the business hosts dedicated housing workshops to combat rogue landlords and supports Lincolnshire Police with community workshops, sharing intelligence data regarding modern slavery and community issues. Another way in which Freshtime supports the wider community is through media outreach: for the last three years, it has sponsored categories in the national Cross Sports Book Awards and the Lincolnshire Life Taste of Excellence Awards. Most recently, it has also worked with cook and food writer Dominic Franks and Lincolnshire-based triathlete and para-cyclist Liz McTernan. Steve Evans, Managing Director of Freshtime, attended the awards ceremony with his colleague Mel Miles, Head of Agronomy and Corporate Social Responsibility. Steve said: “Helping the community is incredibly important to everyone at Freshtime and we are so humbled by this award win; it’s fantastic to be recognised for our efforts by one of our key customers. Freshtime was also recognised by the Co-op as one of its 2017 ethical trade champions, for its exemplary ways of working with them and its proactive and holistic approach to ethical trade which is centred around worker welfare. Last year the business appointed an Ethical Trade Officer for the first time, as part of its ongoing commitment to raising ethical standards within the food industry. Rick Fletcher, who has been in the role since October 2016, said: “I am delighted that Freshtime has been recognised as a supplier that particularly stands out when it comes to ethics, especially within my first year here.